Water, Polymethylsilsesquioxane, Dimethicone, Isohexadecane, Cetearyl Methicone, PEG-40 Stearate, Steareth-2 and Steareth-21. 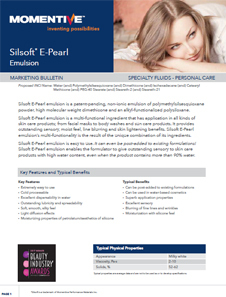 Silsoft* E-Pearl emulsion by Momentive Performance Materials acts as a moisturizing agent. It is a non-ionic emulsion of polymethylsilsesquioxane powder, high molecular weight dimethicone and an alkyl-functionalized polysiloxane. Provides outstanding lubricity and spreadability, soft, smooth, silky feel and light diffusion effects. It is cold processable and extremely easy to use. It enables the formulator to give outstanding sensory to skin care products with high water content (>90%). 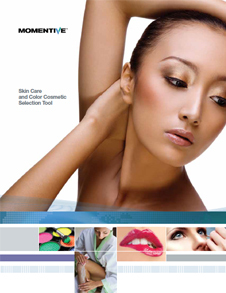 Silsoft* E-Pearl emulsion is used in facial products like masks toners, cleansers, sunscreens, body washes, color cosmetics, eye shadows, blushes and O/W emulsions.